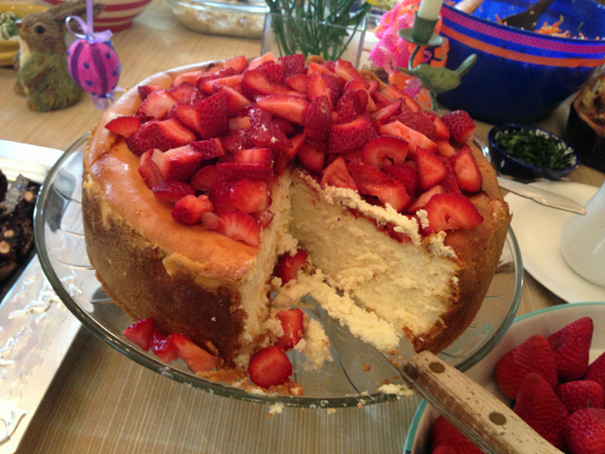 A few weeks ago, I posted this picture of a cheesecake that I ate at Craig’s aunt and uncle’s for Easter brunch and several readers wrote me and asked for the recipe. I wrote Craig’s aunt Liz who put me in touch with Andrea, who made the cake. The secret? “This recipe has twice as much cream cheese as the original recipe called for.” I love that about this recipe because if you’re going to eat something decadent like cheesecake, you may as well make the most decadent cheesecake you can possibly make. This is that cheesecake. Thanks, Andrea, for the recipe. Summary: Adapted by Andrea Curran from another cheesecake recipe. Start with the crust. Mix all the graham cracker crumbs, the melted butter and the 1/4 cup sugar with a rubber spatula and press into a buttered 10.5-inch springform pan. Try to get about 1 1/2 inches up the side of the pan with the pressed crumbs. To make the filling, beat cream cheese until light and fluffy. Shift mixer to low and add the 1 1/2 cups sugar a little at a time; add eggs one at a time, beating after each addition. Add the flour, the vanilla, and the lemon juice, mixing well. Finally, mix in the sour cream. Pour the mixture into the springform pan. Place on the top rack of your preheated oven and bake for one hour and 15 minutes. When done baking, leave in oven with door open and heat off for one more hour. Remove from the oven and let it sit until cooled enough to refrigerate, then refrigerate for 24 hours. To serve, carefully unmold the cheesecake and garnish with strawberries. To make the raspberry sauce, press the raspberries through a strainer, throwing out the seeds. Whisk the liquid with 1/4 cup sugar, the Chambord and the lemon juice. Drizzle over the cheesecake or serve on the side.